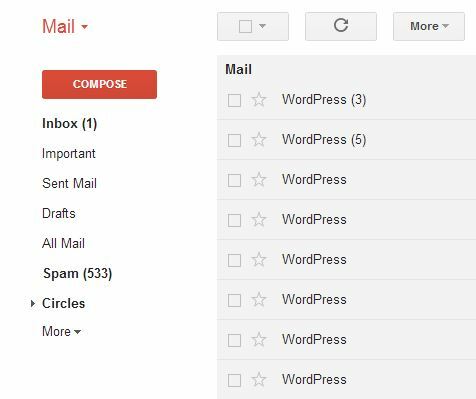 By default, emails sent out from WordPress installations appear as being from “WordPress.” This is less than ideal from a branding perspective. Worse, it may prevent some recipients from reading the email if they don’t recognize who sent it. There are a few solutions for this floating around. Apparently, there is (or was) a plug-in available that addresses this. I couldn’t find it. But, I didn’t look very long because adding another plug-in for this small adjustment seems like over-kill to me. Another solution is to directly change WordPress code so that instead of being hard-coded to use “WordPress”, it would then be hard-coded to use “Your Admin Name”. The problem with that is that you would then have to re-apply the change every time WordPress updates. The solution I settled on is to implement a simple filter. It works by assigning a function to return the value to use for a variable, anywhere that variable is used. In the case below, the function is designed to return the name of the WordPress installation whenever wp_mail_from_name is used. The advantage of this approach is that upgrading WordPress won’t break it. If you’re using a child theme, theme upgrades won’t break it either. Let us know if you find this helpful or have any questions! UPDATE: Here is a link to the WordPress codex reference on this subject. The email from-name can be addressed in the code where wp_mail is used (though, that isn’t always practical if you are relying on theme or plug-in updates). Also, it should be noted that the above method could over-ride from-names for multiple kinds of emails being sent out some of which you may not want to change. Thanks to Thomas Scholz and Andrew Smith for these additional notes.